Contest type -- whether primary or caucus -- has been a topic of discussion in and out of national party rules-making circles in the time since 2016. That Sanders saw successes in that format and Clinton problems essentially forced mode of allocation into rules discussions on the Democratic side. And even Republicans have ventured into talks about potentially providing incentives to states with primaries rather than caucuses for 2020. But most of the action thus far on this front has been on the state level. Maine and Minnesota have both adopted through the legislative process presidential primaries to replace the caucus format for 2020. And Colorado arrived at the same endpoint but via ballot initiative in 2016. In a mark of the type of energy exists behind efforts to shift from caucuses to primaries in the presidential nomination process, two bills have been even been introduced in Hawaii. Now, the Aloha state has traditionally held caucuses rather than a presidential primary. For much of the post-reform era, the two state parties settled into a regular pattern every four years on the presidential primary calendar: Hawaii Republicans started their process with precinct meetings in late January and their Democratic counterparts on the islands followed suit in late February or early March. The regularity with which that pattern occurred developed despite a [state] constitutional provision -- Article II, section 9 -- allowing the addition of a presidential preference primary election. And over the last two decades at least, no legislation has been proposed to add such an election. That changed during the 2018 legislative session. Bills were introduced to establish a presidential preference primary on the second Saturday in May (SB 2584) and one to create a study committee to examine the switch from caucuses to a primary (SB 2249). No, neither bill has gone anywhere, nor are they likely to. Both are bottled up in committee, basically dead after missing legislative deadlines to move the legislation along before the 2018 session adjourns in early May. To some extent that is not exactly evidence of "energy" behind a caucus-to-primary change in Hawaii. However, most of the changes of this sort tend to occur not during midterm election years, but in the year before a presidential election year. Additionally, that anything was proposed at all is worth noting in the case of Hawaii. Again, a regular pattern had developed around caucuses and caucus scheduling, and breaking long-standing traditions is not a goal that is easily attained in the presidential nomination process. Whether that changes in Hawaii in particular is a question for 2019. But this is a phenomenon -- caucus-to-primary shifts -- that is happening at the state level even without a national party prompt at this point in the cycle. Similar to a 2016 push, legislation to establish a separate presidential primary has stalled in the Nebraska legislature. Same sponsor, same intent, same opposition. Senator John Murante (49th, Gretna) introduced legislation -- LB 1032 -- to create a new statewide presidential primary election, severe it from the consolidated May primary, and shift the new election into March. The 2018 legislation is basically the same as the bill from 2016, but rather than move the new election to the first Tuesday after the first Monday in March, the 2018 version would schedule the primary for the second Tuesday in March. "Trump won Indiana and Cruz withdrew from the race and that ended Nebraska's opportunity to have a voice," Murante said. An early presidential primary election would provide that opportunity, he said. The reasoning for the move is the same as it was two years ago even before Nebraskans had cast their 2016 primary votes. It was additionally a goal of the sponsor to entice Nebraska Democrats -- already with an earlier caucus -- to opt into the earlier primary with the potential for increased participation. However, the reasoning against was similarly as consistent in 2018 as it was in 2016. The costs of primaries in the Cornhusker state are laid on the shoulders of the counties, and county officials in the committee hearing again balked at the $1.6 million price tag. State actors often have the willingness to make these moves to earlier dates, but do not always have an ability to bring such a change to fruition. Often the ability portion of the equation -- especially when it is lacking -- comes down to the hit such a move would have on the budget. If the costs are too high, a primary stays where it is. LB 1032 according to the Journal Star failed to gain priority and will see no further legislative action in 2018. Most primary moves occur in the year before the presidential primary. The Democratic National Committee is coming off its 2018 winter meeting, a meeting that culminated with the acceptance of an interim report on the 2020 rules. That report followed continued discussions by the Rules and Bylaws Committee (RBC) in conjunction with the winter meeting and a previous preparatory RBC meeting just a week before. FHQ tuned in to both rounds of RBC discussions and continues to be struck by the framing of the rules discussions in media accounts. By far the most dominant lens through which those rules discussions are being viewed is the lingering Clinton-Sanders tensions in the broader party coalition. And it is not that those depictions are wrong. Rather, it is that they are overly simplistic and have missed some important developments along the way that run against that frame. This phenomenon is at its most stark with respect to the party's efforts on superdelegates, the unpledged elected officials and party leaders that have periodically been controversial in Democratic presidential nomination politics. On the surface, there is a group that wants to see superdelegates go and an opposing group that wants to maintain the status quo. And there also exists the aforementioned Clinton-Sanders divide left over from the 2016 race. These two cleavages in the party are often treated as reinforcing in the context of these 2020 rules discussions. And that is an easy conclusion at which to arrive: the Clinton/establishment faction wants to keep the current superdelegate system intact while the Sanders group would like to see them go. However, there is growing evidence that that is just not the case; that those two divides do not buttress each other nearly so completely as is often described. For starters, for all of the chatter about the purge of loosely Sanders-aligned members of the RBC by DNC chair, Tom Perez, during and after the 2017 DNC fall meeting in Las Vegas, the committee has not exactly moved against the interests of the Sanders faction in the context of the 2020 rules discussions. The fear within that faction at the time and since was and has been that the RBC would ignore or dilute the recommendations of the Unity Reform Commission. On the matter of superdelegates, neither has been the case. In fact, the RBC interim report to the DNC stated that the committee "agrees [with the Unity Reform Commission] that the Party must revise the role and reduce the perceived influence that automatic unpledged delegates have in the presidential nominating process." Furthermore, David McDonald, RBC member from Washington, summed up the committee work to this point quite well in observing that there is consensus on the RBC to make a change -- revise and reduce -- but not on the nature of the influence superdelegates have on the nomination process. In other words, at the very least, there is a perception problem with the current superdelegate system. That, too, was voiced by other members of the committee during the RBC session on superdelegates at the winter meeting. Rather than a keep superdelegates/get rid of superdelegates divide, then, there is within the RBC a perception problem surrounding superdelegates. And that is less about stay or go or Clinton-Sanders and more about how to reduce the perceived role of those unpledged delegates in the Democratic nomination process. That "how" question, and particularly the options that have been developed to address that how, cross-cut both of the other cleavages as well. Working from the Unity Reform Commission recommendations, the RBC hit something of a wall. This is something that has been missed in nearly all of the accounts of the two early March RBC meetings. Neither the pooled vote option nor the alternate vote option recommended by the Unity Reform Commission have been viewed by the RBC as wholly acceptable answers to the superdelegate problem. The alternate vote option drew fire from state party chairs on the RBC for overly complicating the roles of both them and their parties in administering the delegate selection process. Another issue that arose from the discussion of the alternate vote option was the potential for forcing abstentions from superdelegates bound to candidates they do not support. And the pooled vote option, while perhaps a more elegant option, saw pushback from members of the RBC over its automatic transmission of superdelegate votes to the state tally sheet, removing the need for an actual human to fill the delegate slot. As RBC member Elaine Kamarck remarked, if the party moves in that direction "why even have a convention at all." Together, those criticisms moved the discussion in a different direction: eliminate the superdelegate votes on the first ballot for the presidential nomination. Elimination is a simpler solution relative to the intricacies of the alternate vote option. Additionally, it is, perhaps, a logical if not justifiable (to some) step beyond the pooled vote option. Eliminating superdelegate votes on the first ballot circumvents the non-voting problem for some but not all superdelegates by applying it to all superdelegates on a vote -- the first ballot -- that has settled every Democratic nomination since 1952. Now, there are arguments on the merits against the elimination option, but FHQ will save that for a separate post. Suffice it to say, however, there are three main options that are before the RBC that can be roughly arranged from complicated (alternate vote option) to easy to explain. The need for the latter was made apparent during a nearly hourlong back and forth around the three ideas at the winter meeting RBC gathering. There is some desire within the group to not only devise a set of rules to address the superdelegate perception problem, but one that is easy to describe/more easily understood by the rank-and-file of the party. Yes, the Clinton-Sanders divide remains a part of this discussion, but it is more a function of external pressure -- outside of the RBC1 -- weighing on the decisions of the group. Finally, it is worth drilling down and focusing on the options the committee is considering. That way lies the functioning lines of demarcation on the RBC. This, too, overlaps some with both #1 and #2 above, but again, not perfectly. The bottom line here is over whether the answer to a complex problem can or should be parsimonious or demand further complex rules-making. As the RBC, and ultimately the DNC, continue to work toward a resolution on superdelegate and other rules for the 2020 process, the above frames all should be considered and combine to give us a better picture of what is going on than repeatedly dipping back into the Clinton-Sanders well of explanations. 1 This is outside the RBC in terms of outside groups but also members of the DNC (those not on the RBC) who nonetheless want to see a curbing of if not end to the superdelegate role. 2 Add-on superdelegates were moved from unpledged to pledged and the total base number of delegates was raised from 3000 to 3700, reducing the percentage of superdelegates in the process. Below is the interim report that the Rules and Bylaws Committee will submit to the Democratic National Committee at its Winter 2018 meeting. The report serves as a progress update on the RBC consideration of the Unity Reform Commission report from December 2017. "...a tight circle of aides has been brainstorming a range of tear-up-the-playbook ideas for a White House run, according to people who’ve been part of the discussions or told about them. On the list: announcing his candidacy either really early or really late in the primary process so that he’d define the field around him or let it define itself before scrambling the field; skipping Iowa and New Hampshire and going straight to South Carolina, where he has always had a strong base of support; announcing a running mate right out of the gate and possibly picking one from outside of politics; and making a pitch that he can be a bridge not just to disaffected Democrats, but to Republicans revolting against President Donald Trump." It is kind of early in the cycle for the "skipping states" discussion, but with 2020 giving all indications (at this time) of being a wild nomination cycle on the Democratic side, perhaps it is an idea worth exploring anew. The premise remains the same: pick a spot on the calendar/state contest where you are more likely to succeed, win then/there, and keep winning on the way to the nomination. Simple, right? In reality, that has proven easier said, or maybe strategized, than done. It did not go as planned when Al Gore focused on the Southern Super Tuesday states in 1988, and it did not work for Rudy Giuliani twenty years later when he attempted to resurrect a similar strategic path by putting everything on the late January Florida primary. Both campaigns foresaw their respective foci as springboards. Gore from a delegate haul in his home region that would give him enough of a lead to make it difficult for others to catch up. And Giuliani from a winner-take-all Florida win into a series of contests a week later when half the country would be voting. Gore split the South with Michael Dukakis and Jesse Jackson, leaving behind his natural base of support and with no delegate advantage to show for it. Giuliani lost Florida to John McCain and the Arizona senator -- winner in New Hampshire and South Carolina -- used that series of wins to effectively wrap up the nomination a week after Florida on Super Tuesday. Now, FHQ does not want to make too much of just two cases, but they are instructive with respect to the prospective "Biden to skip Iowa and New Hampshire" strategy in 2020.1 Nominees -- or frontrunners in real time during the primaries -- do not skip states. Those campaigns do not cede wins, delegates, and attention to their opponents for a month. But the allure of South Carolina to Biden is clear and under a rationale much like those above. A win in the Palmetto state with its heavily African American primary electorate would serve as an important hypothetical precursor to wins across the South. And many of the states of the region -- with similar primary electorates -- vote just a week later. That would be an extension of the Clinton success story from 2016. Wins fueled by African American support across the region built the delegate advantage by which the former secretary of state claimed the nomination. Actually, that is the surest path to the modern Democratic nomination. But skipping Iowa, New Hampshire, and Nevada is no way to start any march to the nomination even with the "South Carolina gateway to the rest of the South" as the centerpiece. That lowers expectations in any of the first three states to zero and raises expectations on anyone camping out waiting in South Carolina. However, expectations can be lowered or rather tempered without ignoring the first three of the carve-outs. Romney's "keep Iowa at arm's length" strategy in 2012 is a decent guide. There was a lot of talk of the former Massachusetts governor skipping Iowa in 2011 to focus on New Hampshire, but while he did not spend a ton of time and effort there, Romney was there. That is lower expectations, but not to zero, not ceding the state to the competition. In a supposedly wide open race, candidates cannot give away anything. And on the Democratic side, get to 15 percent and qualify for and claim whatever delegates you can. Now, if Biden can do that without so much as looking Iowa, New Hampshire, and Nevada's way, then bully for him. But activists and volunteers, not to mention voters in those states will likely not be receptive to such a snub. The skipping strategy throws the baby out with the bathwater. Biden may announce late, but if the campaign seeks to do this properly, then the announcement will not really come as a surprise. Campaigns have to raise money and hire staff to run the operation. That is groundwork that has to be laid well in advance, and the public will see signs of progress (or lack thereof) during the invisible primary regardless of any announcement. To wait on building that campaign infrastructure is to, again, cede it to the competition. Biden stayed on the sidelines too long in 2015, and though the chatter of a possible run was there, donors and campaign operatives were not. They had signed on elsewhere and were not willing to switch. Biden announces early and plays in all of the carve-outs to some extent if he plays at all. 1 The Politico article is another cut in the death by one thousand cuts that the Nevada caucuses continue endure. Presumably, if a Biden campaign is skipping Iowa and New Hampshire to focus on South Carolina, then they are skipping third in the order Nevada as well. 2020 Republican Rules Changes, Part Four: A Caucus-to-Primary Incentive? What lessons do past encouragement structures hold for the potential Republican caucus-to-primary incentives? There are a few main principles arising from the previous exploration of past national party experimentation in motivating state decisions on contest scheduling that may have implications for an incentive program to entice current caucus states, in whole or in part, to adopt primaries. In sum, the deep dive on past incentives hammers home a point that is often echoed in the context of electoral politics: timing is everything. Republicans in 2000 and Democrats in 2008 had ineffective incentives programs to curb frontloading mainly because of poor timing. Those regimes were instituted ahead of cycles where the motivation for states/state parties to frontload primaries and caucuses was at its peak: when there were competitive nomination races in both parties. But those were also cycles that saw the parties act alone on incentives, sending a mix of signals to the decision makers on the state level. That did not change for Democrats in either 2012 or 2016 -- they acted without Republicans on incentives -- but what did was the level of perceived competition for the nomination at the time primary and caucus scheduling decisions were being made. In both cases, the perception was that the level of competition was low and the need to be early was as well. There were no challengers to an internally popular incumbent Democrat (Obama) in 2011, and the most viable alternatives to Clinton sat on the sideline throughout 2015. Couple that with the fact the DNC benefited from the united front both national parties offered on penalties for would-be violating states and there existed a perfect storm for some measure of success. The penalties forced would-be violators stuck in February after 2008 to move for 2012 when the window was contracted to prohibit February contests. Penalties laid the groundwork, then, and some combination of incentives, state-level partisan control, and nomination competition helped determine the stakes and where states ended up on the calendars of the two most recent cycles. And it is FHQ's hypothesis that it is more the partisan control and competition effects driving the movement than the incentives. 2020 may provide a real or at least better test of that hypothesis. Importantly, the motivation that compels state actors to schedule primaries and caucuses earlier in the calendar is different than that which animates the decision on whether to conduct a primary or caucus. Often those two decisions -- frontloading or primary/caucus -- hinge on willingness and ability. It is one thing to ask if a state is willing to, for example, move forward on the calendar, but quite another to ask if that state is able. Compared to ability, there is more often than not a wellspring of willingness. In other words, there is often in at least some quarters of a state some desire to move the state-funded primary to an earlier date on the calendar. Bills frequently get proposed in state legislatures in the year before a presidential election to shift a presidential primary around on the calendar. But not all of those bills ultimately lead to date changes. And the variation across states stems from a number of factors that can be broadly filed under ability. There can be partisan complications should a state be dominated one party while the other has a competitive presidential nomination. There can be structural obstructions as well. The biggest of these obstacles -- the one that has most often separated states that moved to earlier dates and those that did not during the era of frontloading -- was whether presidential primaries were consolidated with those for nominations to other offices. States with separate presidential and other primaries have been much likely to move around the calendar than those with consolidated primaries. Moreover, this points toward another difference between states that do frontload and those that do not: budgetary impact. The financial hit to state budgets can be quite large, preventative even. States, in other words, that have incurred the costs of separating those sets of primaries are willing and much more able to shift primary dates than those with consolidated primaries. This same willingness/ability concept can be extended to the primary/caucus decision as well, but with some subtle and not so subtle differences. In some cases, the ability may be there, but not the willingness. A state-funded primary option may be in place, but a state party may opt for caucuses instead. After 2016, this has been a point of contention on the Democratic side in the national party considerations of 2020 rules. Idaho, Nebraska, and Washington all had primaries at their disposal, but the state Democratic parties in all three states stuck with the caucus/convention system. That group of caucus states differs from the majority of caucus states where state parties may have the willingness to hold a primary, but lack the ability. In the latter group, there is no state-funded option and little to no state party funding exists for what is a less effective party-run primary. A national party stands a better chance of nudging the caucus states with a state-funded primary toward adopting the primary. That is, a stick and/or carrot to the state party may be effective at triggering such a transition. But with that other group of caucus states -- those where state funding is not forthcoming -- national parties often have their hands tied. While they may be able to compel a state party to make a change, forcing state legislatures to appropriate the resources necessary for a primary is a different matter. And that appropriation serves as an important aspect to flag in all of this. That is what separates attempts to curb frontloading from similar efforts to scale back the reach of the caucus/convention system. The national parties face less resistance from state governments -- whether motivated by penalties or incentives (and/or directly or indirectly through state parties) -- on reversing frontloading than on compelling a caucus to primary transition. Much of the answer lies in the financing. The ask is not costless in the case of states with contests too early in the calendar from the perspective of the national parties, but it costs considerably less in terms of the budget hit to those state governments. Those states have already incurred the opportunity costs of creating separate presidential primaries or moving a consolidated primary up in the calendar. Instead, the price to be paid is one measured in influence over the presidential nomination process. As a primary or caucus slips further into the calendar, the less likely it will be to have a marked influence over the shape of the nomination race. But for the majority of caucus states, the contours of the caucus/primary or caucus to primary decision remains different. In that case, the national party is attempting to motivate a change in mode of nomination from the state party, and the acceptance of a financial cost -- funding a primary -- by a state legislature. State governments that balk at that push shift the costs to the state parties, and state parties have tended to opt for cheaper caucuses over costly party-run primaries. The national party push to curb frontloading succeeded when both national parties informally agreed a uniform shift in the start of the calendar after the 2008 cycle. Penalties in place on both sides thereafter were sufficient enough to draw most states into compliance for 2012, and the increased severity of Republican penalties for 2016 completed the task. It is under those conditions -- a united front -- that a similar effort to move states from caucuses to primaries would be stand a better chance of success. Republican incentives may work on some states, but would likely see more widespread effects if the DNC was pushing in a similar direction. And that does not have to be in the same way. Again, Republicans have fought back frontloading with a series of penalties while the Democrats have used a combination of penalties and incentives over the last two cycles. In other words, Republicans could utilize an incentives system to draw caucus states toward primaries while the Democrats rely on some other method. There have been discussions on the periphery of the 2020 Democratic rules-making process of penalties for states with caucuses where a state-funded primary is available. But that process, at this point in time, looks to produce a more passive national party declaration of preference (for primaries over caucuses) than a more forceful penalties regime. Still, across both parties those signals may be enough to affect some change at the state level. Even without that national party prompt, the number of caucus states has already waned since 2016. Colorado, Maine, and Minnesota will all have presidential primary options in 2020. And Nebraska, Washington, and Wyoming have all explored either establishing primaries or strengthening the ones they have. Much of the impetus for that change or that exploration emerged not from the national parties but organically based on the strain placed on state parties to effectively accommodate those who wanted to participate in 2016. Given those lessons from other incentives programs, is this Republican proposal likely to work? The answer to this question is not as clear because the actual parameters of the the proposed incentives remain unknown. It is, after all, still a proposal. FHQ remains skeptical that they are. Parties in the White House tend to stick with the rules they have; the rules that helped get the president where he is. In looking at renomination, the Trump campaign and the RNC may be eyeing the curbing of a structure that did not benefit the president in the 2016 process. But if the president runs unopposed or faces only a token challenge, then the state response has often been to cancel primaries and select delegates through a caucus/convention process or even via state committee selection. Rather than reducing the number of caucuses, then, there tends to be an expansion of caucuses on the incumbent party side. Obviously, the success of such an incentive regime would depend on the size of the carrot and to which states it applies. On some level, the bigger the incentive is, the more likely it is that states would be to opt for them. But that can open the door to a logistical problem for the national parties based on which states qualify. A broad application to current primary states and those caucus states that opt in could dramatically increase the total number of delegates to the convention. This does not come without a cost to the national party in planning the convention. However, a more narrow application, targeted at current caucus states, would allow a potentially larger incentive that would have a more minimal impact on the total number of convention delegates. This is an issue the DNC has had with its bonuses and other rules tweaks over the decades. Adding more delegates reduces the number of sites that can actually accommodate a national convention. Regardless, this is a consideration the RNC will have to wrestle with if it is serious about an incentive program like the bare bones of the one proposed. FHQ remains skeptical of just how effective this potential caucus-to-primary incentive the RNC Temporary Committee on the Presidential Nominating Process (TCPNP) is discussing. As the above discussion should indicate, there are a number of moving parts. Ultimately, however, this is something that is most likely narrowly directed at those caucus states that opted out of preference votes in caucuses in 2016. Call that the unfinished business path. Those states -- mostly North Dakota, but in part Colorado and Wyoming -- had delegate selection plans that, while compliant, were not in keeping with the delegate binding changes made after 2012. An incentive may be just enough to get them to reconsider. Time, however, will tell that tale. Part Four: A Caucus-to-Primary Incentive? Whether the intention of a caucus-to-primary incentive is applied to a narrow list of targets or anything broader, they all belie the fact that such bonus delegate incentive programs have not historically been effective (or effective in the absence of certain conditions). The RNC first used a bonus delegate system to entice states to later dates on the primary calendar for the 2000 cycle. To curb frontloading, the goal was to provide a bonus of five percent to states in the March 15-April 14 window, a 7.5 percent addition for contests in April 15-May 14 window, and a ten precent bonus for states with primaries or caucuses scheduled from May 15 through the third Tuesday in June. However, the experiment was met by a collective cold shoulder from the states. Only three states moved back beyond the March 15 point on the calendar from 1996-2000. South Dakota shifted from a late February primary in 1996 to its traditional early June position for 2000 after three consecutive cycles in February. Oregon, too, moved back for 2000, from a mid-March 1996 primary back to its traditional position back in mid-May 2000. Finally, Wisconsin pushed back from a mid-March position alongside neighbors Illinois, Michigan, and Ohio -- a Great Lakes subregional primary -- in 1996 to its traditional spot at the beginning of April in 2000. All three moved to "old" positions where the contests in those states have been more often than not in the post-reform era. And Oregon and Wisconsin reverted to those positions after a one cycle break in 1996 from those traditional scheduling patterns. But by far the biggest beneficiaries of the 2000 cycle bonus delegates program were states that were already scheduled on or after March 15 in both cycles. In other words, states that did nothing from 1996-2000 got the most out of the rules change. Given the overall response -- or lack thereof -- the RNC scrapped the program for 2004 and has increasingly focused on penalizing non-compliance in the time since. Sticks rather than carrots, then. 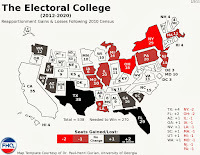 Despite the failed Republican experimentation in 2000, Democrats devised their own bonus delegates regime to counter the frontloading impulse among the states beginning with the 2008 cycle. The differences across the two plans were twofold. First, the Democratic system created two groups of beneficiaries: 1) states that held their later positions on the calendar and 2) states that moved back from their earlier 2004 positions to later 2008 positions. Additionally, the 2008 system the Democrats utilized amplified the delegates added. Depending on how late the contests were scheduled, states in the first category -- holding steady -- got five or ten percent bonuses tacked on to their base delegations (not including superdelegates). That was pretty consistent with the Republican system from 2000. But it was the second category that saw the true increase in incentives. Early states from 2004 that moved their primaries or caucuses back for 2008 saw either a 15 or 30 percent addition to their base delegations, again, depending on how far back the contest was shifted in 2008. However, even with a more aggressive bonus system, the results remained about the same for Democrats in 2008 as they had been for Republicans in 2000. Ten states gained Democratic bonuses in 2008, but only two of those ten -- Guam and North Carolina -- moved back. The remaining 80 percent of states that received a delegate bump were awarded the smaller bonuses for not moving at all, but remaining late. The scorecard for early experimentation in bonus delegate incentives, then, just did not show much success. Although, much of that can be attributed to timing rather than any specific failure of the two programs. The primary calendars in 2000 and 2008 were arguably the two most frontloaded of the post-reform era. On one hand that makes the incentive systems look even more ineffective. The system was intended to combat the frontloading of presidential primaries and caucuses, but saw the trend accelerate instead. But on the other hand, additional factors may have been driving actors on the state level to ignore the potential bonuses. For starters, California's 1996 shift from June to late March and subsequent 2000 move to the front end of March changed the decision-making calculus in state houses across the country. With Florida, New York, and Texas among others already in early March, California's moves pushed the total number of delegates available early in the calendar to a level not seen in the post-reform era. Such severe frontloading had the potential to resolve nomination races earlier. And that was the fear in some states: that the race(s) would be over by the time the process got too deep into the calendar. Influence over the nomination process is not possible if the the race is resolved, whether by the viable candidates other than the presumptive nominee withdrawing and/or one candidate winning a majority of the total delegates. It was on that latter route that delegate-rich California joining a growing number of states in early March had the greatest impact. Moreover, the relatively quick pace with which both the Democratic and Republican nominations were settled in 2000 confirmed that state-level anxiety -- fear of missing out -- for subsequent cycles. It increased the likelihood that states would consider a jump to the early part of the calendar. And in fact, the DNC widened its window in which states could hold primaries and caucuses to include February for the 2004 cycle in the hopes of deciding on a nominee faster. In other words, the DNC traded for 2004 the desire to combat frontloading for the potential to resolve more quickly the party's nomination and set their sights on defeating a Republican incumbent. While some states shifted into February for 2004, it was not until the 2008 cycle that a mass of states sought to move even closer to the beginning of the calendar year. Why? As was the case in 2000, the 2008 cycle had competitive nomination races in both parties. That can and did open up the floodgates to increase frontloading decisions on the state level. Very simply, then, the motivation for going early in most cases far outweighed the incentives offered by the parties in either 2000 or 2008 to not do so. And bear in mind also that the parties did not offer a united front on incentives to go later in the calendar. At the national level the Republicans walked that road alone in 2000 and the Democrats did likewise in 2008. Successes in and after 2012? Elements of these relationships began to change following the 2008 cycle, giving at least the impression that the tide had turned on incentives to beat back the frontloading trend. In both 2012 and 2016, there was an expansion of incentives-based success stories. However, the overarching picture is more complex. There were more states that took advantage of the revised incentives the Democratic Party offered in 2012. But again, conditions unique to the cycle may have contributed more to state-level decisions than the incentives themselves. First, the DNC altered its incentive structure for 2012, dropping the distinction between states that were merely holding a pre-existing position late in the calendar and those that actually moved back to later dates. In lieu of that system, the Democrats created two separate bonuses. The first of these was a 10 or 20 percent boost granted to states that held primaries after late March. Those in May or later received the largest bump. Additionally, however, the DNC attempted to further encourage the adoption of later calendar positions by offering a bonus for three or more contiguous states clustering their contests at points on the latter half of the primary calendar. And this latter bonus could be combined with the timing bonus. In other words, a state like Montana in early June could get as much as a 35 percent increase to its base delegation for 1) holding a June primary and 2) doing so alongside neighboring North and South Dakota. On the surface, this new structure appears to have worked in 2012. 33 states and territories took advantage of some combination of the two incentives, and only one-third of them -- 11 states and territories -- benefited by doing nothing more than retaining their positions later on the calendar from previous cycles. That left 22 additional states and territories that made decisions to shift back their primaries or caucuses from 2008 to 2012. But while that looks like a win for the incentives Democrats employed for 2012, those bonuses were only part of a broader array of factors driving state-level decision making that cycle. 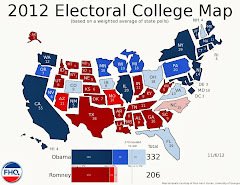 At the national party level, the early February collection of contests coupled with the even earlier start to primary season that those February contests had at least partially triggered, brought on some further reflection on the factors motivating frontloading. Obviously, the DNC saw enough success in or some cause to maintain some form of incentive system after 2008. Yet, both parties were forced to enforce their respective penalties for calendar timing violations in 2008.1 And when the national parties informally, yet collectively, closed February off to states other than the four carve-out states (Iowa, New Hampshire, Nevada and South Carolina), the parallel rules changes across parties left a significant number of states in need of a change to state law to comply with the new national party rules. And there was a pattern to the movement or non-movement. States that were non-compliant with January and February contests or those that shifted into March tended to be Republican-controlled while states that moved to April and later spots on the 2012 calendar were more likely to be Democratic-controlled. That outcome was driven in large measure due to the differing stakes across parties. The competition and stakes were higher for Republicans. They had an active nomination race. Democrats, on the other hand, with an internally popular and ultimately unchallenged incumbent in the White House had less at stake during the nomination phase of the process. While Republican states had an incentive to have an earlier voice in the Republican nomination process, Democratic-controlled states could afford to slip deeper into the calendar, enticed by delegate incentives, an ulterior motive of affecting the Republican nomination process, or some combination of the two.3 The need to be early, as established during the frontloading era, was not there for Democrats in the way that it was for Republicans in 2012. There were breaks in that partisan/competition pattern for 2012. 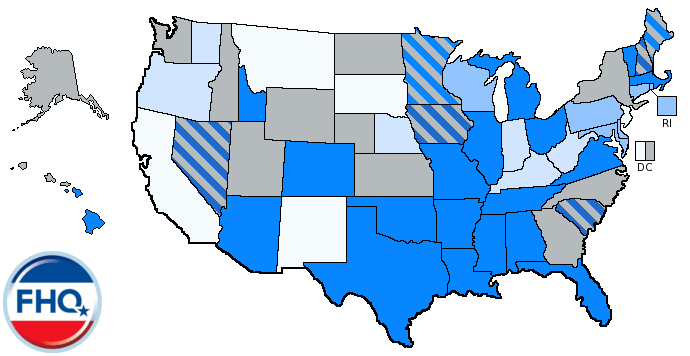 Often that deviation was driven by budgetary constraints that forced a number of states to reconsolidate their formerly early presidential primaries with later state and local primaries (see Arkansas, California, and New Jersey) or moving an already-consolidated primary back to a traditional spot on the calendar (see Illinois). Other states had lingering state-level disputes over redistricting that forced a reconsideration of positions (Ohio) or an outright delay to when the primary could be held (Texas). In general, though, that partisan pattern held in 2012. States that moved back the most tended to be Democratic states. Delegate incentives may have played a role in motivating how far states shifted from 2008 to 2012, but that operated alongside the unified threat of penalties in both parties and the competition-based stakes across them. And there is a strong argument to be made that the penalties motivated the move while the combination of delegate incentives, state-level partisan control, and competitive stakes influenced how large the shift was. And the tale was similar in 2016. Most of the motivation to move to earlier spots was on the Republican side of the equation for 2016. The RNC mostly eliminated the caucus loophole (see footnote #2) and increased its penalties for timing violations. That made the price for holding a primary or caucus before March much higher in 2016, pushing the holdout states in violation of the (intention of the) rules in 2012 to resettle into compliant March slots for the 2016 cycle. And that was a group of mostly Republican-controlled states -- Florida, Michigan, and Missouri -- in which decision-makers were not factoring in the DNC delegate incentive structure. Other late 2012 states also pushed forward for 2016 as well. They too were newly Republican-controlled (Arkansas and North Carolina) or Republican-controlled and reverting to traditional positions following the resolution of redistricting disputes (Texas). That Republican-driven calendar movement had implications for the lure if not use of incentives to states in the Democratic process. In total, eight states lost Democratic delegate bonuses from 2012 to 2016. Of those eight, five -- Arkansas, Florida, Michigan, North Carolina, and Texas -- were Republican-controlled states with primaries. The remaining three -- Democrats Abroad, Kansas, and Nebraska -- were caucus states where state parties were making strategic scheduling decisions. In addition to those eight states losing incentives-based bonuses, Hawaii and Utah -- both caucus states as well -- moved to calendar positions and into clusters, gaining them Democratic bonuses. But that net of six states losing bonuses from 2012 to 2016 indicates more a maintenance of the status quo for the incentive structure Democrats carried over virtually unchanged into an open nomination cycle.4 If the lack of competition mattered to Democratic adoptions of bonus-producing strategies on the state level for 2012, then the increased competition of 2016 should have raised the number of states forgoing incentives in 2016. It did, but only marginally. But again, most of the change was Republican-driven. Democrats were not in a position of power in state capitols across the country, and thus, not in a position to make changes into incentives or into earlier calendar positions. Moreover, the competition that developed between Clinton and Sanders during primary season 2016, was not fully formed (or recognized) in 2015 when decisions were being made on primary and caucus scheduling. Sanders was emerging but had not yet emerged as the not-Clinton in the Democratic nomination race by mid-2015. Democrats, then, may tout the overall pictures of incentives adoption in 2012 and 2016 as successes, but the above is an overly lengthy way of saying that the supposed effectiveness of the incentives structure can potentially be explained away by other factors. It should also not be lost that the incentives have not faced a test under truly competitive circumstances. 2020 may offer such a test. And under heightened stakes, the trade-off between incentives for later calendar positions may be outweighed by the state-level desire to weigh in before it is too late. But what that means for Republicans and any effort to encourage caucus states to shift to primaries presents a different set of questions. The final installment in this series will tease out the lessons from the above and apply them to a potential Republican incentive for 2020. 1 The DNC Rules and Bylaws Committee penalties on violating states like Florida and Michigan in the immediate lead up to and during primary season in 2008 was a roller coaster. The RBC first stripped both states of their full delegations in fall 2007 when neither state/state parties could either force a move of their respective primaries or accept remedial caucuses. That the Democratic race between Obama and Clinton was as close as it was kept the results of the two under the microscope throughout primary season. Just before the end the 2008 calendar, the Rules and Bylaws Committee returned to the original 50 percent delegate penalty called for in the delegate selection rules, before opting to seat the full delegations from both states at the convention. That move has often been cast as the party ultimately bowing to the states, but the DNC ex post facto reasoning on that progression and how penalties could be assessed in the future is the the penalty was in place when it counted, during primary season. The RNC took a different path, penalizing violating states during primary season and through to the convention. The true intent of the party's 50 percent penalty has always been kept, but the implementation has occasionally meant the seating of a full delegation from a violating state, but reducing those delegate votes to/by half. 2 States like Arizona, Florida and Michigan demonstrated a willingness to take the 50 percent reduction in exchange for the potential for early influence over the contested 2012 Republican nomination race. But a number of caucus states also stuck with February dates but skirted penalty because the first step in their processes elected delegates to the next tier but without a concurrent presidential preference vote. 3 This ulterior motive could be described in a number of ways: helping a more conservative candidate emerge by backloading contests in bluer states and/or hurting frontrunner Mitt Romney by depriving him of wins in perceived hospitable territory, but also as lengthening the Republican process and/or stoking internal divisions in the Republican Party. The simplest explanation is that the Democrats, with no active nomination of their own, were informally playing on the periphery of the Republican process. 4 The 2016 bonus delegate regime remained the same as in 2012 with one exception. An adjustment was made to when the bonus window opened to account for there being five Tuesdays in March 2016 as opposed to the four in March 2012. The correction meant the window opened at approximately the same point on the calendar; March 20, 2012 and March 22, 2016. And what is the Republican Temporary Committee on the Presidential Nominating Process looking at potentially changing for 2020? At the most recent RNC meeting -- the 2018 Winter meeting in Washington -- the Temporary Committee on the Presidential Nominating Process (TCPNP) reconvened, and the chatter coming out of that meeting was muted compared to the often Clinton-Sanders-themed talk that emerged from the periodic Democratic Unity Reform Commission meetings. But the points of emphasis in the Republican discussion fit expectations. The discussed changes were minimal, incremental, and tailored to the president's experiences/problems with the 2016 process. The headliner change proposal coming out of the Winter meeting was an incentive structure intended to promote primaries over caucuses as the mode of delegate allocation. Under the proposal, states using a primary election would stand to gain additional delegates to the national convention while caucus states would not. Now, the change was framed in the article as a move to prevent future candidates, whether they face off against Trump in 2020 or run in subsequent cycles, from replicating the caucus strategy the Ted Cruz campaign utilized in 2016. But that is just one interpretation of the impetus behind this particular proposal. Again, it stands to reason that overall changes would be minimal and intended to fix any (perceived) problems from the vantage point of the president/his team/the RNC. And attempting to minimize the role of caucuses reads like something out of the score-settling handbook. In other words, Cruz did well in caucuses, then "let's do something about caucuses" is the response. But there are flaws in framing this proposal in that manner. The first problem is the RNC is not in the same position the DNC is in. Trump versus Cruz is not the dominant feature of these discussions, not in the way that the Clinton-Sanders divide animated the Unity Reform Commission process on the Democratic side anyway. Additionally, it should be noted that the caucus issue runs deeper than Trump-Cruz for Republican rules makers. For starters, the Cruz campaign really only replicated a strategy that Ron Paul beta tested in 2012 in those caucus states with a cache of unbound delegates.1 That was less a Trump-Cruz issue than an RNC-state parties phenomenon that Cruz later exploited in Colorado, North Dakota and Wyoming in particular in 2016. Dating to the post-2012 environment, the RNC sought to deal with the Paul loophole by adding to Rule 16 a binding mechanism that locked delegates in based the results of preference votes in either primaries or caucuses. The problem was that some states -- the three above and a number of territories -- wanted to maintain their traditions of keeping delegates unbound heading into the national convention. Those states accomplished that by not holding a preference vote at all in precinct caucuses. Instead, those caucuses progressed -- electing delegates to the next step(s) in the process -- without regard to any presidential preference. Put simply, no preference vote, no bound delegates. Of course, it went beyond unbound delegates for the Cruz camp to be sure. They also sought to elect delegates in the selection process who, while bound through the allocation process to another candidate (often Trump), were Cruz supporters at heart. That bond only lasted through, in most cases, the first ballot vote on the nomination at the convention. But the hope from the Cruz campaign perspective was that 1) if enough Cruz-sympathetic delegates were selected they could vote to unbind the themselves or 2) as a last resort, those delegates would be free on subsequent votes should no candidate achieve a majority of support among the convention delegates during the first round. Those hopes were dashed when the Convention Rules Committee removed all questions about the enforcement of the binding mechanism called for in the rules and later when the full convention adopted those rules for the 2016 convention. But the RNC dealt with that particular Cruz activity at the convention. The proposal to dangle a carrot in front of a small number of caucus states is aimed, FHQ would argue, at bringing the remaining few holdouts -- those that avoided a preference vote in order to maintain unbound delegations -- into the fold. To repeat, that is not exactly a Trump-Cruz story or even a Cruz story. It is an RNC finishing up the work it started in and after 2012 story. As evidence look at the number of unbound caucus states from 2012. There were nine then, but just three in 2016.2 Two-thirds of the unbound states, then, complied with the rules change. Under a narrow interpretation, this proposed incentive regime -- bonus delegates for a primary (and a preference vote) -- is aimed squarely at those three states, Colorado, North Dakota and Wyoming. It is designed to give them just a bit more incentive to opt into a primary. And it may not take too much in a couple of those cases. Colorado adopted a presidential primary through ballot measure in 2016 general election and the resulting law uses national party rules to box the state parties into the primary to some extent. Just north in Wyoming, the subject of an establishment of a presidential primary was broached in the legislature there in 2017, but the state parties and county clerks (election administrators) balked at the plan over funding and procedural issues, respectively. A small incentive may be enough to bring those states/state parties on board. And if such a proposal brought along other caucus states beyond those targeted, all the better, perhaps, from the perspective of the RNC. Utah, for example, passed legislation in 2017 to fund a presidential primary for 2020. That state-level funding plus the potential promise of additional delegates may be enough to entice Beehive state Republicans into using the primary option as they did in 2000, 2008, and 2012. Granted, the exception -- the last time before 2016 that Utah Republicans used a caucus -- in that window of contests was 2004, the last time the Republican presidential nomination was uncontested. But delegate incentive plans in the past have not necessarily proven effective at reining in state level activity. The record is mixed and the plans often untested. Part three will examine the history or national party incentives. 1 And truth be told, the 2012 Paul campaign beta testing mimicked a strategy employed a generation before it in 1988 by Christian conservatives who sought to fill unbound delegate spots with their supporters during the delegate selection process. 2 And even then, the way the RNC legal counsel interpreted the rules, delegates candidates who filed to run as affiliated with a particular candidate were treated as bound in states with no preference vote. Most delegates candidates who were selected to fill slots in Colorado and Wyoming were affiliated with a particular candidate and thus bound. Only a small subset of Colorado and Wyoming filed as unaffiliated and thus remained unbound. That left only North Dakota as a state with a completely unbound delegation. There was no affiliation requirement there in filing to run as a delegate candidate. On the occasion last month of the 2018 Republican National Committee winter meeting in Washington, DC, the Temporary Committee on the Presidential Nominating Process (TCPNP) reconvened to discuss potential rules changes for the 2020 cycle. From a comparative standpoint, the chatter on rules tweaking for 2020 on the Republican side has been far quieter than the open discussions the Democratic Unity Reform Commission had throughout 2017. However, that near silence should not necessarily be read as inactivity. Rather, it is a function of a party that 1) remains new to tinkering on its presidential nominating rules outside of a convention setting, 2) tends to conduct its temporary committee functions largely outside of the public eye, and 3) currently holds the White House. The first two factors are unique to the RNC while the third is not. It was not, for instance, until the 2008 Republican National Convention empowered the Temporary Delegate Selection Committee that the party allowed for rules-making outside of the convention.1 The rules change recommendations the committee made were passed onto the RNC Rules Committee, then the full RNC before being added to and enacted in the rules that governed the 2012 process. This was streamlined further with the codification of external rules-making powers through Rule 12, adopted at the 2012 convention for the 2016 cycle. It was Rule 12 that allowed the RNC through the Rules Committee to make rules changes on the nomination subset of the Rules of the Republican Party as long as those changes were made well enough in advance -- end of summer of the midterm election year -- of the contestation of the next presidential nomination process. Rule 12 has carried over to the 2020 cycle, but so, too, has a temporary committee structure with a specific mission. But in the three cycles now since 2008, the RNC has had a slightly different method for dealing with alterations to the rules outside of the convention. Of note also is that, regardless of which party, the party in the White House tends to leave well enough alone with its rules. The rationale has been simple enough: At least something went right with the preceding nominating process if the person nominated went on to win the White House. Through a different lens the same rationale could be framed as a president -- as the head of a party -- has a preference for the rules that got him or her nominated and elected in the first place. In other words, there is at least something of a structural explanation for a why parties currently occupying the White House tend to mostly sit on their laurels with respect to nomination rules. But while the RNC and the Temporary Committee for the Presidential Nominating Process have been mostly quiet, neither is exactly poised to stand pat with the 2016 rules that led to Trump's nomination, even if the historical combination of motivations/tendencies to maintain the status quo exists. So where are the Republicans in the 2020 rules-making process? As is the case on the Democratic side the clock is ticking down to the time when both national parties have tended to finalize their rules for an upcoming presidential nomination process. Typically, the national party input in the process is complete by around the end of the summer of the midterm election year. That allows both the nascent campaigns and the states -- state governments and state parties -- enough lead time to ensure their ability to respond to any changes made at the national level before the process begins toward the beginning of the presidential election year. Although the RNC structure for dealing with rules changes outside the convention has evolved as described above, the timing of the structure in place for 2020 rules changes mimics how the DNC has more often than not handled its rules-making process. That is to say, an external committee/commission examines the rules and their collective effectiveness in the previous cycle(s) during the year after a presidential election, and makes recommendations for rules changes to the respective Rules committees to consider during the midterm election year. That leads to a vote by the full national party on whatever recommendations have filtered through the Rules committees. In the end, there are a couple of main structural differences between the parties with respect to the formation of rules for 2020. First, the Republicans are operating on a lag compared to the Democrats. Under the conditions of the amendment passed at the 2016 Democratic National Convention, the Unity Reform Commission was to be named and in place within 60 days of the early 2017 election of the new national party chair. And the URC was additionally to have made its recommendations to the DNC Rules and Bylaws Committee by January 1, 2018. By comparison, the Temporary Committee on the Presidential Nominating Process -- via Rule 10(a)(11) -- was not to have been solidified until the end of June 2017 with recommendations due no later than the end of May 2018. Motivated by the tendencies described above, the Republicans are also operating with less urgency than their Democratic counterparts. No, urgency is not structural, per se, but it could be argued the presence or lack of urgency in rules-making has had an impact on the structural parameters of the process for 2020. There may yet be a challenge to Trump for the Republican presidential nomination, but the party -- at the organizational and mass levels -- remains behind the president and is behaving as if he will be, even if facing some opposition, the 2020 nominee. The process and its direction (more on this in subsequent posts) reflect that. The TCPNP has met twice and in both instances it has been in conjunction with national party meetings; the summer 2017 meeting and the winter 2018 meeting. By contrast, the DNC Unity Reform Commission planned to convene four times, but tacked a fifth meeting onto the agenda to finalize recommendations. Of those five meetings between May and December 2017, only one coincided with a seasonal DNC meeting; the October fall meeting in Las Vegas. A portion of that is just differences across the parties, but part is also the conditions facing the parties and the differing motivations they create. Part two of this series will look at what proposals the TCPNP has discussed and how they stem as incremental progress from the rules tinkering the RNC has undertaken in recent cycles. In part three, FHQ will look at the history of incentives programs intended motivate state action in some area of the delegate selection process. And finally, the fourth part in the series will examine the lessons to be gleaned from that history of national party experimentation with incentives-based regimes and how effective they may be in 2020. 1 As a point of clarification, rules had been discussed and tinkered with outside of the Republican convention before 2008, but as part of a process leading up to a convention that would adopt changes for the next cycle. An inter-cycle discussion between 1992 and 1996, for example, would have been precursor to changes adopted at the 1996 convention for the 2000 process. A post-1992 version of the Temporary Delegate Selection Committee, on the other hand, would have made recommendations on the rules for the 1996 process. But the process was more drawn out during that era and the convention was the only forum in which rules could officially be changed. That changed after 2008. As day two of the second DNC Rules and Bylaws Committee (RBC) meeting of 2018 gets underway, FHQ will revisit a topic that hovered around the periphery of the group's first meeting in January and is likely to be dealt with in a more concerted manner at this stage of the RBC's work: caucuses. The Unity Reform Commission resolution/mandate called for the encouragement of expanded primary use. While the URC deliberations and report included provisions attempting to open up/ease primary and caucus participation and pushed to make caucuses more primary-like, the group failed to more forcefully "encourage the expanded use of primaries". Additionally, the main failure of the URC on this front was that the group voted down an amendment that would have curbed the use of caucuses in states where a state-funded primary is available. To add insult to injury, the vote to table said amendment was actually a tie among the membership of the URC. A tie that was broken by the chair (Jennifer O'Malley Dillon of the Clinton campaign) and vice chair (Larry Cohen, a Sanders appointee to the URC). The RBC should act where the URC failed to fulfill its mandate. This is an oversimplification, but gets at the heart of the petition and its request for the RBC. The source material -- the original recommendation and amendment, and the petition, both in full -- are linked above. Having established that, there are at least a couple of contextual threads that are missing in this discussion. 1) a) The chair, Jennifer O'Malley Dillon, is probably mostly wrongfully accused in all of this. "Clinton supporter votes down caucus-curbing measure, siding with Sanders contingent" is a nice headline, but obscures a lot about the progression of the series of URC meetings and sequence of the final one in particular. FHQ will start with the latter (because the former touches on the second contextual thread). That there was a tie on the motion to table David Hyunh's amendment in the first place is noteworthy. The URC was set up with 19 members (not counting the chair and vice chair): nine Clinton appointees, seven Sanders appointees, and three additional members appointed by DNC chairman, Tom Perez. But the tie that was ultimately broken by the chair and vice chair ended up 9-9. First, Clinton appointee, Charlie Baker's absence looms large. Had he been there on day two, this vote may have gone in a different direction. Also, Clinton/Perez appointees, Marcia Fudge and Jan Bauer joined the Sanders faction to equalize the votes on each side. b) From a procedural perspective, the discussion of the caucus section did not have the benefit of the overnight period that the primaries, superdelegates, and party reform sections had. All three of those "buckets" were dealt with on day one of the final URC meeting, and subgroups of members coordinated language clean up sessions on elements of those sections and amendments to them for outside of the public meeting. The caucus section did not have the benefit of that time following the section discussion early in day two. Disputes in the caucuses section, then, did not have the amount of post-discussion time for clean up that others had. Additionally, that ran into the time crunch of wrapping up a meeting that, at that point in day two, was already stretching into the afternoon when it was to have adjourned around noon. Members were not only fighting fatigue at that point, but also the need in some/many cases to catch flights out of DC. In some ways, then, O'Malley Dillon's vote was one to table a discussion in a stalemate with no time -- or perhaps not sufficient time -- to fix. It punted the issue to the RBC. 2) Now all of that belies the fact that the caucuses section fell fourth in the order and was discussed alone on day two before the URC turned to tabled items from day one. That may indicate something about how the issue was prioritized within the group. 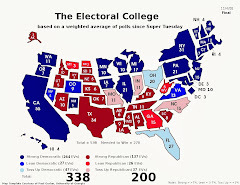 In states with five or more congressional districts that hold a state-run Democratic presidential primary, there should be presumption that the state's delegate selection plan use the outcome of primaries to allocate delegates for the respective presidential candidates rather than a caucus. "In 2016, Democrats witnessed first-hand that caucuses inherently disenfranchised voters, especially communities of color, working families and individuals part of the disability community. In Nebraska, a little more than 20,000 voters participated in the party's caucuses on March 5, 2016, but over 80,000 voters participated in the Nebraska non-binding presidential primary held May 24, 2016. Those 80,000 votes cast by Nebraskans were simply ignored for the purposes of electing our Democratic nominee. In Washington State, an estimated 230,000 voters participated in the party caucuses on March 26, 2016, but over 800,000 voters participated in the May 24th non-binding presidential primary. Those 800,000 votes were basically thrown away as if they were never casted. Under the current Democratic nomination process--the one that some members of the Unity Reform Commission want to remain in place, Party leadership can simply ignore the larger results of the presidential primaries and use the results of lesser-attended party caucuses to allocate its delegates." More were affected in Washington than in Nebraska. Again, that is not to suggest that anyone affected in that caucus-to-primary gap in the Cornhusker state was not "harmed" in some way, but rather to say that fewer were than in a larger state like Washington. And there are partisan and procedural elements involved here in addition to the big state/small state difference. The line drawn between Washington on the one hand and Idaho and Nebraska on the other, is one that separates a competitive-to-Democratic state from two rural and Republican states. Those latter two states (and potentially others that might join the group), as was pointed out by Nebraska Democratic Party chair, Jane Kleeb, are more apt, given their Republican control at the state level, to operate under practices and procedures as well as administer the primary election in a manner that does not necessarily improve the quality of the delegate selection process. In other words, it creates a trade-off between increasing/decreasing turnout and poorly run primaries/better-run caucuses. That is a trade-off with no clear winning position. But the bottom line is that the distinction made was an important if incremental step in the direction of the URC mandate of encouraging expanded use of primaries. Yes, by just one state that currently falls into the category of "has a state-funded primary and has more than five congressional districts," but that is more than the zero currently affected by the non-recommendation made. And why did that original recommendation not make it into the final URC report? If the URC resolution calls on the group to make recommendations to encourage the expanded use of primaries, then why not include all states where a state-funded primary option exists? So not just Washington, but Idaho and Nebraska as well. And Hyunh's amendment reflected that, removing the "five or more congressional districts" from the beginning of the proposed recommendation. But that amendment triggered a diverse discussion that ended in stalemate, tabling not only the amendment but the underlying original proposal it sought to change. In an effort to rope Idaho and Nebraska into the coverage of the recommendation, then, Washington was lost, the caucuses working subgroup compromise was lost. Moreover, it is reasonable to assume that the compromise -- the distinction drawn between larger and smaller states with state-funded primaries -- would have passed muster with the full URC if considered. Looking at the votes across all of the sections -- primaries, superdelegates, party reform, and caucuses -- there was a lot of unanimity. Sure, there were a couple of symbolic votes in dissent of the creation of superdelegates categories, but it was just that, symbolic (from the Sanders wing of the URC). Everything else was virtually unanimous, demonstrating deference to the work of the working subgroups in each section if not outright support of the recommendations included. Would the effort to curb caucus usage to just small states with state-funded primary options have similarly passed? That answer is not clear, but was is is the part the amendment played in derailing the originally proposed recommendation. Now, none of that ultimately affects whether the Rules and Bylaws Committee acts on this matter. What the URC handed the RBC was a list of recommended changes. The RBC can follow them, ignore them, or augment them. But the URC retains the ability to take the full set of recommendations to the full DNC for consideration if the RBC strays to far from the recommendations in the collective view of the group. But FHQ will close with a point we made on the proposed recommendation and amendment in question after the final URC meeting in December. That proposed change would have made for a fairly weak recommendation. Even if either one of those options -- the original subgroup compromise or the amended version -- had made it into the URC report, it merely would have presumed that a state with a state-funded primary would utilize that state-run election. In other words, neither version of the recommendation would have required a state to opt for a primary. Ultimately, the report the Unity Reform Commission passed on to the Rules and Bylaws Committee is a series of recommendations; suggested changes to the rules, bylaws and charter of the Democratic National Committee. And much of the recommendations lacked specifics. More often than not, the bulk of the document serves as an aspirational document, punting the role of determining how and if to implement them to the RBC. And the RBC, now two meetings in, is very clearly fulfilling that role. 1. The Democratic National Committee and the Party at all levels shall use all means, including encouraging legislation and changing Party rules, to expand the use of primaries, wherever possible. 1) The RBC in that meeting took issue with the burden that the "shall" in that recommendation placed on states/state parties. That it was language for a requirement; language that did not sufficiently recognize some of the conflicts that caucus states tend to have (i.e. : states with no state-funded primary). 2) Instead the RBC seemingly leaned in the direction of a move to "express a [DNC] preference for primaries" as part of the call for the convention. Although, there was mention of adding it as a part of a proposed amendment to Rule 2 of the DNC delegate selection rules (regarding participation). That amendment, offered by Frank Leone (DNC & RBC member, VA), would consolidate much of the primaries recommendations section into a Rule 2 that would set a threshold for state parties to "take provable, positive steps" toward, in this case, more open participation in the process. In the past, states were required to take provable, positive steps with respect to changing primary and caucus timing when in violation of the party rules. In states where Democrats were not in control of the state legislature, minority party Democratic legislators proposing legislation to change a primary date -- even if ultimately stymied -- was a sufficient provable, positive action, for example. But, again, the RBC seemingly leaned in its second meeting in the direction of a more passive expression of preference for primaries over caucuses than anything more active, including either of the options for the limited number of caucus states with state-funded primary options discussed above in the original post. FHQ will note, however, that the URC discussion of such a primaries-usage requirement for that group of states -- caucus states like Idaho, Nebraska, and Washington with state-funded primary options -- was apparently footnoted in the documentation the RBC had before it at the second meeting. Said footnote was raised by David McDonald (DNC & RBC member, WA), but did not lead to any further discussion among the members of the RBC. Take that as further proof of the RBC's leanings on the matter if one will.